Recently, I've been getting a lot of compliments on my skin and complexion. I did change up my skincare routine about six months ago, and I guess it's now showing! Since I've had several requests to share my skincare routine, I decided to put together a post of my top, daily used products. 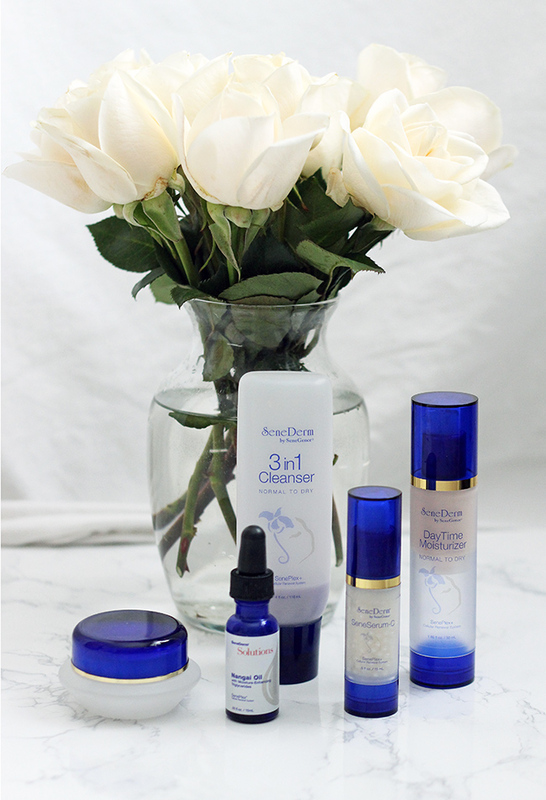 You'll notice that a lot of the skincare that I use is by SeneGence (most commonly known for LipSense), which I happen to be a distributor for. I joined the company a little over a year ago, not even knowing that they made skincare! Never in a million years did I think I would be working for a direct sales company, but after trying LipSense just once, I was hooked, and knew I needed the product in every color. So I signed up to be a distributor for the discount, and to sell LipSense to my friends and family because I knew they would love it too, and it's turned into a great business. 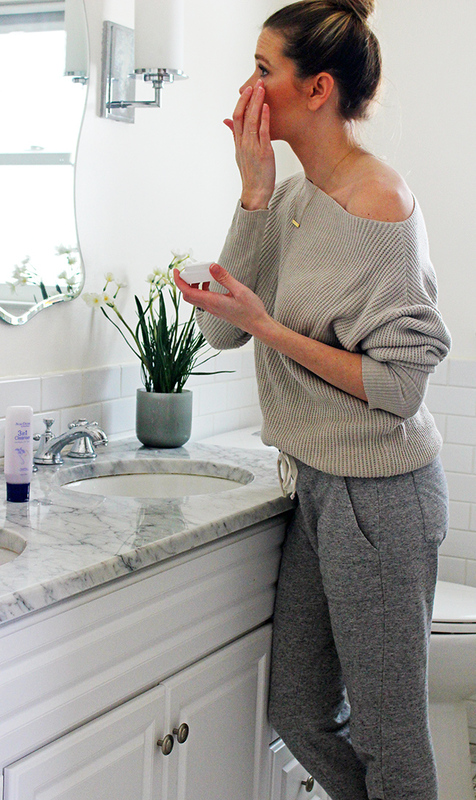 It wasn't until six months ago, that I decided to try SeneGence's skincare, and you guys, I've been missing out! These products have actually given me great results (a lot of products that I've tried in the past, just don't work on me)! Not only are they good for your skin, but they contain SenePlex Complex, which is a kinetic enzyme that speeds up the rate of cellular renewal. That means your dead skin (epidermis) is going to shed at a faster rate, revealing a fresh, new layer of skin, in hence, making you look younger, faster. Although I do add some other products into my mix weekly, these are the products that I use on a daily basis, and would cry if I were without them! SeneGence Normal To Dry 3-in-1 Cleanser: (used morning and night) I love this facial cleaner! It cleanses, exfoliates, and tones all in one, while helping to maintain skin's moisture. Available in four formulas (Dry, Normal to Dry, Normal to Oily and Oily to Acne) there is a perfect option for every skin type. It's detergent free (a major plus for me) and it has anti-aging properties. So while it's cleansing all the dirt and makeup off my face at the end of the day, it's also working to make me look younger! Plus, it's gentle enough for my sensitive skin. SeneSerum-C: (used morning and night) I've said it before, and I'll say it again: every women, no matter what age, should be using a Vitamin C serum on her face! Not only is Vitamin C necessary for collagen production (which by the way stops in your late 20!! ), but it also protects your skin cells from free radical damage. But don't be fooled, not every Vitamin C serum does what it claims. Vitamin C needs to be stabilized and active in order to reap it's benefits. Most serums that you get from the drug store (and some department stores) are not packaged in a way to keep the Vitamin C stabilized, which means by the time you buy the product, and get it on your face, the vitamin is no longer active, and therefore not going to give you any results. SeneSerum-C is packaged in little, pearl-like beads that keep it stable until the second you put it on your face! It's also a 100% natural blend of the most advanced anti-aging ingredients known today. It works to repair damaged skin cells, while preventing further damage, and create healthier, firmer skin, It also helps reduce the signs of sun and age spots. Sorry for the info overload, I just feel so strongly about this product! Nangai Oil: (used day and night) There is nothing that my dry skin craves more during the winter than an oil. So finding one that was both non-comedogenic, and good for the skin was important. Little did I know (at first) that the company I work had Nangai Oil, which is the most hydrating ingredient on the planet. No lie! It is made with 94%-97% Triglycerides, and is the purest form of moisture known today that can be applied to the skin. Not only is it all natural, but it also has anti-aging properties. Although I don't use it every morning, just the ones I'm feeling extra dry, I do use it nightly all over my face. I also use it on my cuticles, in my hair, and for the dry patches on my elbows. SeneGence Daytime Moisturizer: (used morning) This moisturizer is lightweight and doesn't feel greasy on the skin. It also has anti-aging advantages, and a mechanical shield that protects from the sun and free radicals. elta MD UV Daily: Although both my daytime moisturizer, and foundation both have sun protection (equivalent to an SPF 30), my dermatologist taught me that it's never enough to use beauty products with SPF. That's when she told be about elta MD's UV Daily, and I've been addicted since. As someone who battles with melasma, I'll never leave the house without this on. It feels light on the skin, and it doesn't have a scent. It's actually the only SPF that I've tried that doesn't have even the slightest sunscreen smell. 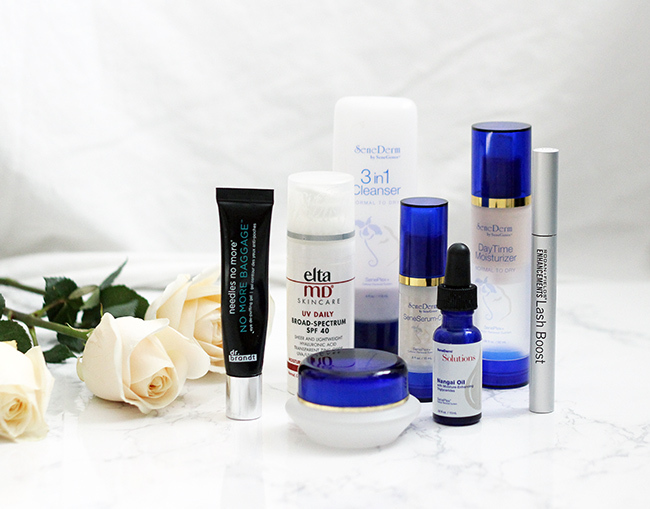 Dr Brandt No More Baggage: (used morning) It was a couple of months ago, that every single blogger I follow was raving about this product, so I had to give it a try! It claims to reduce the look of under eye bags, dark circles, and fine lines. Although it hasn't done much for my fine line and dark circles, it does help with my puffy eyes in the morning. 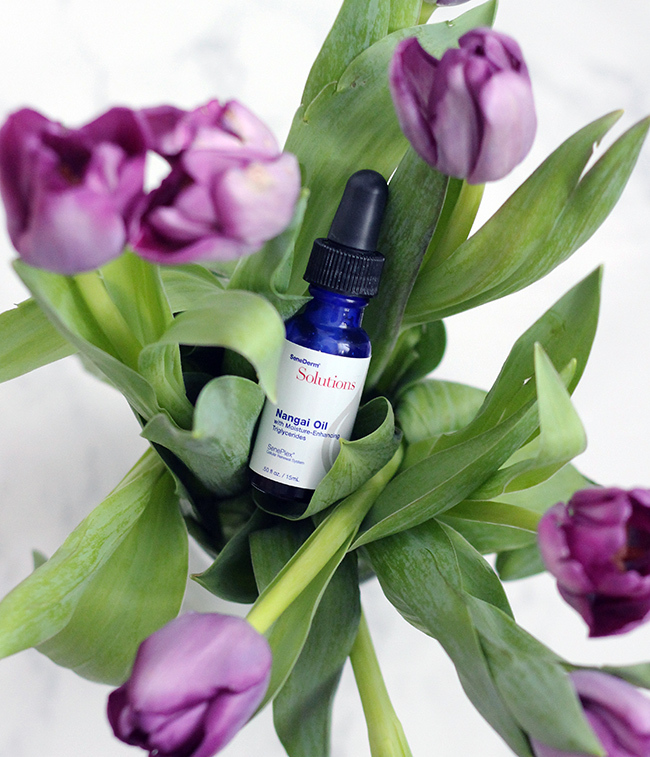 Immediately after applying, I can feel my skin tightening, making those sleepless nights, or that extra glass of wine the night before, go unnoticed. SeneGence Eye Cream: (used nighttime) For nights, I use SeneGence Eye Cream. This is a thicker formula than any other eye cream that I've tried, and goes on like silk. Not only does it improve the skin's hydration, but it soothes the delicate skin around the eye, and helps to increase elasticity. R&F Lash Boost: (used nighttime) This products has worked miracles on my eyelashes! 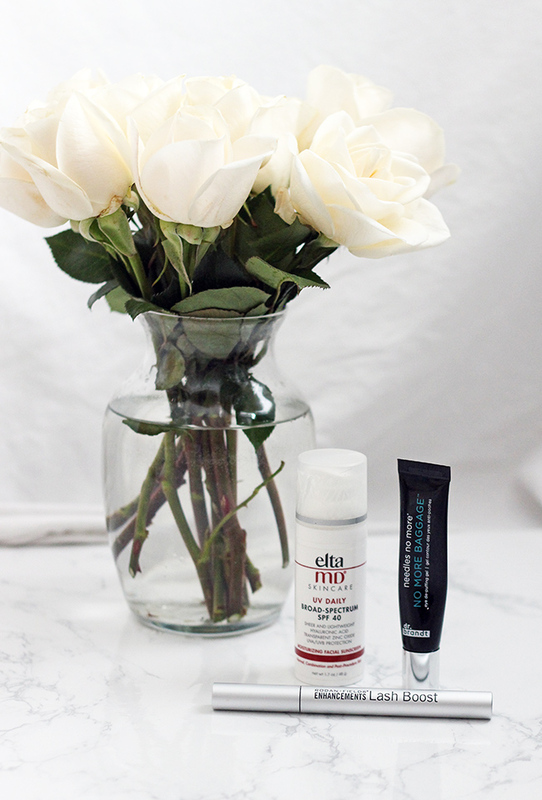 I've tried a few eyelash serums in the past, and none have given me the results that Lash Boost has given me (and yes, that includes the SeneGence Lash Extend). For someone who normally lacks in the eyelash department, mine have grown long enough that I actually get compliments on them! Plus, paired with my all time favorite mascara, and I almost don't need to use false lashes anymore! I wish everyone a great weekend! I'd love to hear, what is your favorite skincare product? Leave me your answer in the comments below. The feature blogger is Katrina from Katrina Gwen Rose. I'm loving this red lip on her, and she has the best tips on choosing the right lipstick shade for your skin tone. Make sure to stop by her blog to check out the post, and say hello. Wow ladies thank you so much for the feature! You are the sweetest! 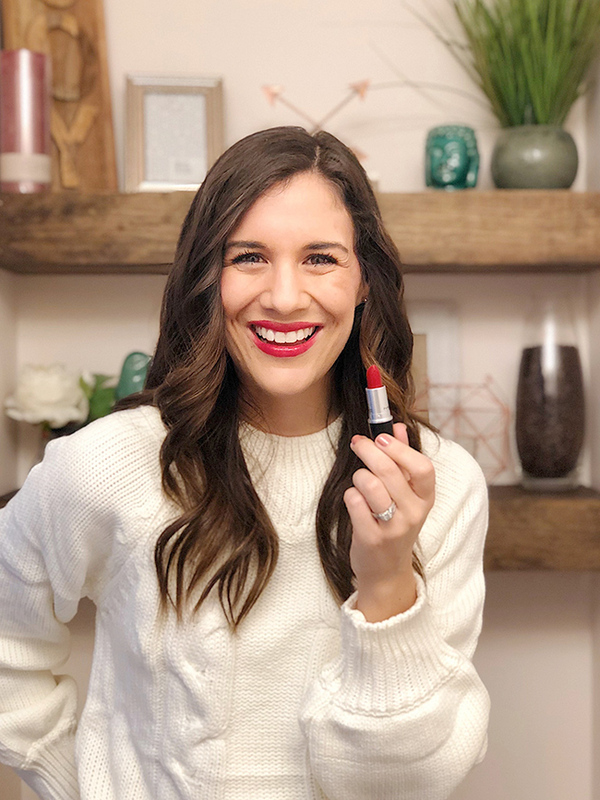 I have been a lipsense lover and was always curious about their skin care products - I am going to have to check them out now! You have such beautiful skin! I am always looking for new skin products, I will have to them a try! 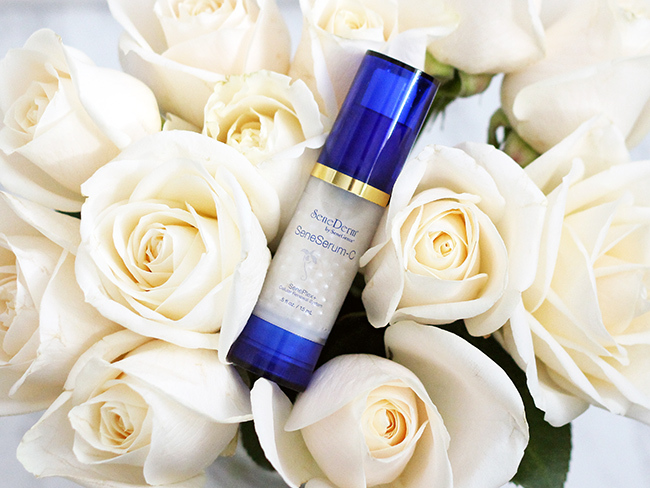 Your skin is always flawless, thanks for letting us in your little secret! I haven't tired lip sense, I feel like I'm the only girl in the whole world who has't tried it. In my area it isn't a big thing, so trying it out becomes a problem. That 3 in 1 cleanser and serum C are in my wishlist!! Some great products I haven't had a chance to try, your skin is always glowing so I will have to try these! Your skin always looks great. Thanks for sharing! I've heard from so many people that the R+F lash boost is a miracle product. I think I need to bite the bullet and try it! Sheela, I'm bummed LipSense didn't work for you. It has honestly changed my lipstick game! I'm not sure what percentage of Vitamin C is in the serum (it's not listed in any of my product guides) but I'm looking to find out. It know it's one of the main ingredients listed. I also haven't tried adding Ferulic Acid, and am def going to look into it. Thank you so much for sharing!! I have been hearing so many great things about Vitamin C! I am definitely interested in starting to bring that into my skincare. You complexion always looks beautiful! Your skin does look great! I was using a Vitamin C serum and then I ran out and never refilled it... I've been hearing more and more about SeneGence products! That is neat that LipSense also carries skin products! Vitamin C serum is definitely a game changer! Love reading about other gal's routines. I love seeing what other people use! Adding a vitamin C serum in my skincare routine has made such a difference! I love Dr. Brandt's no more baggage too! This is a really nice routine, with really high quality products. I should definitely check out some of these. Thanks for sharing dear! Just ordered some Elta MD today and I love my Lash Boost! 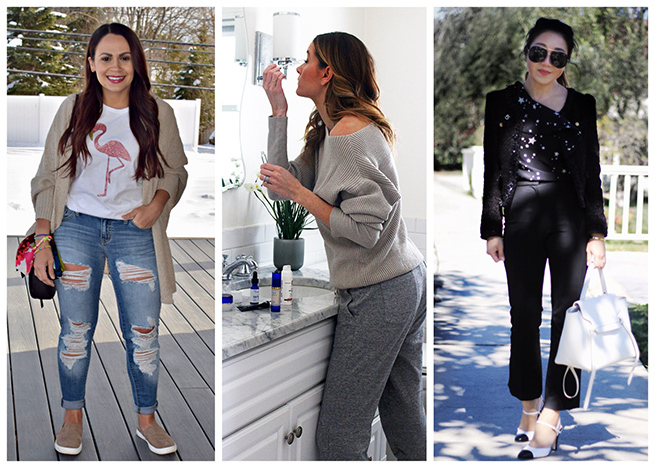 Thanks for sharing and loving your comfy look! Isn't Lash Boost the best! I love the Elta MD, and actually need to place an order myself as mine is almost out! 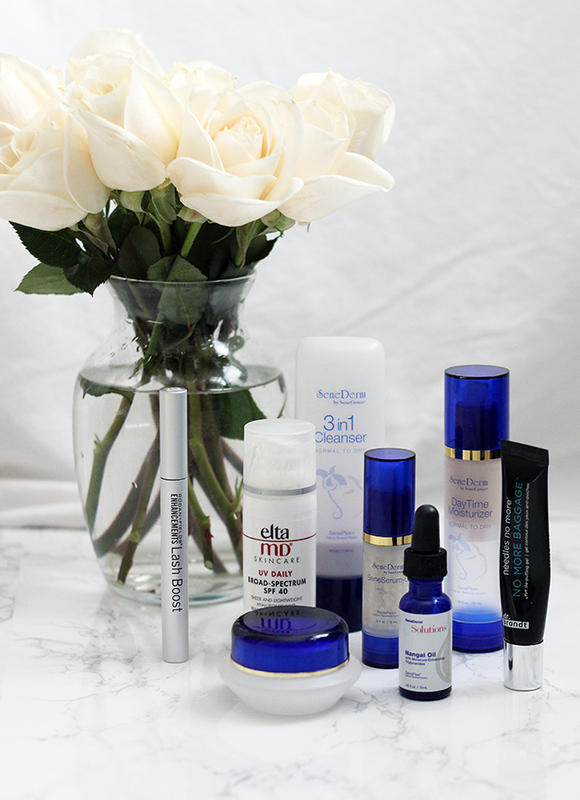 Rachael, I have recently started to explore a new skincare routine, so I really appreciate this post so much! It gets too expensive to just start trying products without the advice and experience from trusted friends! I will definitely be looking more into these products! And this post will be a featured favorite on my blog tomorrow! Thank you for always linking up and supporting what I do! Thank you Shelbee, and so excited to be featured! I'm the same way, and love hearing about new products for friends and bloggers that I trust!